The Resilient Leader: Am I my Avatar? 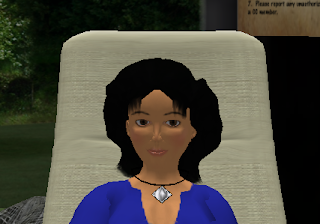 My Avatar, Dora Felisimo, has been gradually coming out of the closet. Why has she been so reluctant to announce herself? Shouldn't there be some sort of debutante ball or something? The reason "She", I mean "I", or I guess, "We" are hesitant is because within my circle of family, friends and colleagues, Second Life is still something way too weird. I frequently find myself being an evangelist for a cause I am not entirely sure I want to embrace. Yet I keep getting drawn back into this virtual world as it seems to offer interesting opportunities. Or maybe its just fun. So I find myself flying around, visiting various islands, and walking through walls. I recently held a meeting of like-mined OD consultants in Second Life and we agreed 3D technology and virtual worlds have interesting applicability for our work...especially for learning and development and collaboration. However, there is a major stumbling block for most people and as a psychologist I think a primary issue is the difficulty in identifying with your avatar, especially given: (1)The visuals--the avatar does not realistically look like you, and (2)The name--you have a fake name. Of course those are also factors which can add value to the experience in a virtual world--you can be anyone you want to be, including anonymous, which allows for unique learning experiences not possible elsewhere. But for most people, the silliness of the avatar is going to detract from the seriousness of what you can accomplish in this medium. Am I my avatar? Well, no, I do have a "real life". But I find my alias, Dora, can be quite helpful at times.